You won't find lasting joy gift-wrapped at the base of an evergreen three, adorned with a red bow. 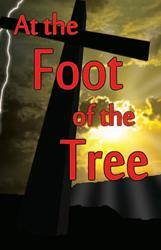 But you can find it at the foot of a much uglier tree, cross-shaped and blood-stained. Christ came, not to remain a baby, but to give His life on that tree as the perfect sacrifice for sins. Christmas is approaching; have you noticed? Suddenly evergreens and striped mint candy are in high demand. Men in red suits roam the streets, and bargain hunters crowd the stores. Nativity displays on lawns and flickering Christmas lights brighten the night. The clerks at the checkout counters don hats they would feel silly wearing at any other time of year. Folks frantically buy gifts and plan their Christmas eve parties. Could it be that these folks are searching for something to give meaning to their lives? Something that gives them a purpose bigger and broader than their own selfish existence? Not everyone who puts up a tree, hangs out lights, buys gifts, or wears a floppy red hat is doing it just for fun. There are many people who, through all the glitz and glamour of Christmas, sense dimly that Christ’s birth really did have great significance for mankind. Something about the Christmas story stirs their heartstrings. So the loudspeakers at the supermarket play “Joy to the World,” and people enjoy it. At a time of year when tempers are short and credit card bills are long, it’s nice to hear about joy. Perhaps people see Christmas as a respite from the rat race of selfishness some of them have run all year. With all the present-buying, it should be a season when people think of giving to others, not just getting. It is more blessed to give than to receive, even for people who don’t realize it. But all too soon, the normal, me-first way of life takes over again. If only lasting happiness could be found, gift-wrapped, under an evergreen tree! Some people, more knowledgeable than the rest, will remember their Bibles on Christmas Day. They will turn to Luke 2 and read how one night over 2,000 years ago angels appeared in the sky, bringing glad tidings to the earth. A baby was born in a stable. His name was Emmanuel, God with us. They will rejoice over the old story full of such good news. And they will close the book of Luke, wish each other “Merry Christmas!” and go on with life. Are you among those who are caught up in the “Christmas spirit”? If so, we would like to challenge you to read not only Luke 2, about the birth of Christ, but also to read the rest of the Book. We challenge you to study the Bible and learn that the story of Jesus in the manger is just a small part of the Story. As the Story unfolds, the baby in the manger doesn’t stay there. He becomes a Man with a mission. Despite many twists and turns of the plot, He fulfills that mission perfectly. What was that mission? To bring true joy to earth, just like the angels said. No, you will not find lasting joy at the foot of an evergreen tree, wrapped in shiny paper and topped with a red bow. But you can find it at the foot of a much uglier tree whose sides are dyed with red. Jesus died on a cross, to which the Bible also refers as a tree (Acts 5:30). Christ came, not to remain a baby, but to give His life on that tree as the perfect sacrifice for sins. If you kneel at the foot of this tree, the cross of Calvary, and cry for help to the Man who died on it, you will receive the best gift ever given by God to man, the gift of eternal life. If you yield your life to Him, receiving Him as your Lord, you will be rescued from sin and receive the right to become a child of God (John 1:12). And you will be invited to attend a time of heavenly joy and worship that will never end! (Revelation 19:7–9).